The only day with strong SW winds was the first producing just a single FULMAR from Chittening Warth and eighty KITTIWAKE off Severn Beach. A GREAT CRESTED GREBE was near the 2nd Crossing on the 15th. Single LITTLE EGRET were seen on Northwick Warth (13th) then at the Orchard Pools, Severn Beach (20th-28th). Wader numbers fluctuated during the month but the following were peak counts; 5000 DUNLIN (5th), 1200 LAPWING (15th), 142 OYSTERCATCHER (14th), 105 BLACK-TAILED GODWIT (3rd) and 150 REDSHANK (14th). Scarcer waders included single SPOTTED REDSHANK (14th and 21st), GOLDEN PLOVER (5th), BAR-TAILED GODWIT (23rd) and GREEN SANDPIPER on three dates. Up to two PEREGRINE were seen during the month and a MERLIN on seven dates on Northwick Warth. A WATER RAIL was present at the Orchard Pools. Two RED-BREASTED MERGANSER were reported off Severn Beach (25th). An unusual record here involved five BAR-HEADED GEESE (22nd). A high count of 1000 WIGEON on Northwick Warth (23rd). Scarce gulls included adult YELLOW-LEGGED (6th and 8th), adult MEDITERRANEAN with a GLAUCOUS GULL (last recorded in 1991) on Northwick Warth flash on the 31st. 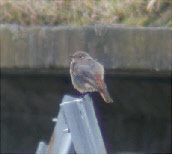 Other birds of note included STONECHAT (present all month) with a maximum of seven birds. A single KINGFISHER was seen at New Pill, Chittening Warth (28th). Dunlin numbers reached 8700 (17th), Black-tailed Godwit peaked at 87 (30th) and a record count of 170 Oystercatcher (29th). Scarcer waders included single CURLEW SANDPIPER (3rd), SPOTTED REDSHANK (3rd and 10th) and the first PURPLE SANDPIPER of the year on the 6th. Up to 18 Grey Plover were seen with smaller numbers of Knot, Golden Plover and Green Sandpiper. A LITTLE EGRET was seen on three dates on Northwick Warth. Strong winds on the 12th produced one FULMAR, six Auks and seven KITTIWAKE, another three on the 14th. Other scarce gulls included, adult MEDITERRANEAN GULL (6th) and YELLOW-LEGGED GULL (16th-30th). At the Orchard Pools, a WATER RAIL was heard on three dates, nine LESSER REDPOLL were seen (9th) and an influx of REDWING was noted from the 10th. STONECHAT were widely reported during the month with a peak count of seven (17th). A MERLIN graced Northwick Warth from the 20th and a BLACK REDSTART was reported at Severn Beach (4th). The first strong winds of the autumn produced few seabirds; on the 25th a RAZORBILL, storm force wind on the 27th produced single STORM PETREL, GUILLEMOT, GREAT SKUA, two FULMAR and 20 KITTIWAKE. Scarce gulls included the adult MEDITERRANEAN GULL throughout the month joined by a first winter on the 5th and 8th. Single adult YELLOW -LEGGED GULLS (5th, 11th) and a LITTLE GULL on Northwick Warth (22nd). Unusual waders included single LITTLE STINT (5th), CURLEW SANDPIPER (18th-27th, 2 on 23rd), two GREENSHANK at Severn Beach (6th), two late COMMON SANDPIPER (21st) and single GREEN SANDPIPERS throughout the month. Duck numbers increased during the month and BRENT GEESE were seen (3 on 16th, one on 27th, 9 on 31st). A WATER RAIL was squealing at the Orchard Pools, Severn Beach on three dates. Late migrants included SPOTTED FLYCATCHER at Aust (2nd), COMMON and LESSER WHITETHROAT (3rd), WHINCHAT (7th), WHEATEAR (20th) and two SWALLOW (21st). Winter migrants included YELLOWHAMMER, thrushes, BRAMBLING, SISKIN, STONECHAT, BLACK REDSTART at New Passage (19th-22nd) and MERLIN on six dates from the 7th. One of the best birds of the month was the appearance of a LESSER SPOTTED WOODPECKER in gardens beneath Aust Cliff on the 16th. A single MANX SHEARWATER on the only SW windy days of the 6th and 7th. Only two records of single LITTLE EGRET (8th,30th). Dunlin and Ringed Plover passed through in low numbers but were joined by CURLEW SANDPIPER early in the month with a maximum of 12 (7th) on Severn Beach and a single being seen on Northwick Warth (18th/19th). LITTLE STINT was recorded on four dates (11th-19th). Up to four RUFF were present on Northwick Warth flash (12th-21st). Single GREENSHANK were seen at Severn Beach 4th and 12th with eight birds at New Passage on the 10th. There were high counts of KNOT on the 3rd (77) and 7th (35) and SANDERLING on 7th (9). The other notable waders, Green and Common Sandpiper, Godwits, Grey and Golden Plover were seen in small numbers during the month. The adult MEDITERRANEAN GULL was seen almost daily and joined by a first winter bird on the 8th. Single adult YELLOW LEGGED GULLS were seen on 12th and 19th. Other birds of note included; COMMON REDSTART on four dates, 1st -7th (two on 1st), SPOTTED FLYCATCHER on eight dates to the 29th (max. 3 birds 16th and 18th), nine WHINCHAT and single GRASSHOPPER WARBLER on 5th. The last GARDEN WARBLER and SWIFT were seen on 21st. On the 28th a TREE PIPIT and BRAMBLING (first September record) were seen. Single HOBBY were seen on six dates to the 20th, two RAVEN were seen in the Aust area and a flock of thirteen BUZZARDS over Severn Beach (1st). A scarce visit of GREAT CRESTED GREBE at New Passage on the 17th and a very mobile LITTLE EGRET 3rd-9th. Returning wildfowl included a small number of WIGEON, TEAL and a drake COMMON SCOTER 3rd -9th. A typical selection of waders with up to two GREENSHANK, four SANDERLING, two WHIMBREL, twelve KNOT, ten COMMON SANDPIPER, five GREEN SANDPIPER and seven BLACK-TAILED GODWIT. The first CURLEW SANDPIPER of the year was an adult on the 8th , with three adults on 19th increasing to ten juveniles on the 31st. The first LITTLE STINT of the year was at Severn Beach on the 19th. Dunlin and Ringed Plover numbers peaked at 400 and 300.Scarce Gulls included the semi resident New Passage adult MEDITERRANEAN GULL with a juvenile at Severn Beach (22nd) and a first summer at New Passage on 31st. Single YELLOW LEGGED GULL were reported on five dates. The only Terns were a SANDWICH on 5th and four COMMON TERN on 31st. The first PIED FLYCATCHER of the year was reported at New Passage on 23rd and up to four SPOTTED FLYCATCHER seen. REDSTART were seen on four dates with two present on 21st. A small number of WHEATEAR and WHINCHAT through out the month and a peak count of five YELLOW WAGTAIL (22nd). Other birds of note included up to two HOBBY and three RAVEN. Strong south west wind in the first two days of the month produced two FULMAR, one GANNET and nine MANX SHEARWATER. The only other "windy" day (23rd) produced a single ARCTIC SKUA. At least three different MEDITERRANEAN GULL (juv., 2nd summer and adult) were seen with the adult seen at NEW passage on many dates. Other gulls and terns included YELLOW LEGGED GULL (25th), two SANDWICH TERN (19th) and two COMMON TERN (30th). Single LITTLE EGRET were sighted at various locations during the month. Wader passage was slow with low numbers of Dunlin, Ringed Plover. Other waders seen were Common and Green Sandpiper, SANDERLING, GREENSHANK, WHIMBREL, BAR-TAILED and BLACK-TAILED GODWIT. There were a few notable duck records; the first confirmed breeding record of Gadwall, returning Pintail, Shoveler, Wigeon, Teal and a "lost" female COMMON SCOTER (25th). One of the rarest sightings involved LESSER SPOTTED WOODPECKER (14th). Returning migrants of interest were SPOTTED FLYCATCHER (6th), NORTHERN WHEATEAR (15th), GRASSHOPPER WARBLER (19th-22nd) and the first ever July record of REDSTART (21st). Other notable records involved single HOBBY and up to four RAVEN. Strong winds at Severn Beach produced single FULMAR (9th) and nine the next day along with a GREAT SKUA. The first June records of LITTLE EGRET occurred on the 7th, 8th and 23rd. Notable wildfowl included 11 CANADA GEESE east over New Passage (4th), a RUDDY DUCK on the Orchard Pools (14th) and drake COMMON SCOTER at Severn Beach (26th). One or two waders started to return including a BAR-TAILED GODWIT at Severn Beach (26th). Other notable birds were HOBBY on three dates, a RAVEN at Northwick Warth (22nd), KINGFISHER at New Passage (30th), two SPOTTED FLYCATCHER at Severn Beach (1st) and the first June record of REDPOLL, over Northwick Warth (9th). The drake GARGANEY remained at the Orchard Pools until the 3rd with another appearing at New Passage on the 9th. A LITTLE TERN was present off Chittening Warth (1st), two SANDWICH TERN (25th) and thirty COMMON TERN (13th). The best bird of the month was an adult LONG TAILED SKUA at Chittening Warth (14th) that flew inland. Other Skuas involved GREAT SKUA (1st), ARCTIC SKUA (3 on 1st, 4 on 14th and 2 on 24th). Strong SW/W winds in the second half of the month produced the following sea birds; FULMAR (10 on 14th, 3 on 24th, 7 on 25th), GANNET (16 on 14th, 1 on 24th, 5 on 25th), two MANX SHEARWATER (14th), up to six STORM PETREL (25th), 200 KITTIWAKE (14th), two GUILLEMOT and eight other Auks ( 14th). A BRENT GOOSE was on Northwick Warth (26th) while more dubious geese were two BAR-HEADED GEESE (4th) and two BARNACLE GEESE at the Orchard Pools (10th). Other notable birds included a LITTLE EGRET (6th), GRASSHOPPER WARBLER and WHINCHAT at the Orchard Pools (4th), HOBBY at Severn Beach (4th), LITTLE RINGED PLOVER on Northwick Warth (7th and 25th), SPOTTED FLYCATCHER at New Passage (30th) and a real local rarity, a TURTLE DOVE at Chittening Warth (14th). Spring migration continued at Severn Beach, with the first two WILLOW WARBLER and YELLOW WAGTAIL (6th), a TREE PIPIT (7th) and a superb NIGHTINGALE in gardens at Aust Cliff (8th) and flock of 7 CROSSBILL at New Passage (9th). Two WHITE WAGTAIL were seen on Northwick Warth (14th) while the first REDSTART of the year was at Northwick Warth (20th) and SWIFT at Severn Beach (25th). Twenty WHEATEAR were at Severn Beach (21st). Waders of note included 12 BAR TAILED GODWIT (6th), four LITTLE RINGED PLOVER (7th), COMMON SANDPIPER at New Passage (9th), GREENSHANK at Severn Beach (13th), and WHIMBREL (1 on 14th with 30 more on 24th). A fine drake GARGANEY appeared on the Orchard Pools on the 12th and was joined by a second (16th until 22nd), one remained until the 30th. A BARNACLE GOOSE joined the Shelduck on Northwick Warth on the 14th. Scarce gulls included four MEDITERRANEAN GULL (13th) and KITTIWAKE (20 on 26th, 50 on 28th). There was a passage of Skuas and terns involving the following; GREAT SKUA (1 on 26th, 2 on 28th), ARCTIC SKUA (2 on 21st, 2 on 27th, 4 on 28th, 3 on 30th), SANDWICH TERN (3 on 24th, 2 on 25th, 6 on 26th), ARCTIC TERN (1 on 21st, 40 on 28th, 65 on 29th), two COMMON TERN (28th) and single BLACK TERN (28th) and LITTLE TERN (30th). A LITTLE EGRET was at New Passage (22nd), a FULMAR at Chittening Warth (29th), GREAT CRESTED GREBE at New Passage (14th). A MERLIN was present on the 4th and SHORT EARED OWL was in the Severn Beach area (13th-24th) and up to four RAVEN were seen. The first signs of spring; 12 CHIFFCHAFF and a WHEATEAR (16th), drake GARGANEY off New Passage (24th), 20 SAND MARTIN (23rd), HOUSE MARTIN and SWALLOW (29th) Two LITTLE-RINGED PLOVER (29th) and three ARCTIC SKUA off Severn Beach on the 31st. A LITTLE EGRET was at the Orchard Pools (2nd-10th). Other notable wildfowl included two GREYLAG GEESE (23rd,24th) and single BRENT GOOSE (9th) at Severn Beach, COMMON SCOTER at New Passage (17th).At least one SHORT EARED OWL frequented the Severn Beach area (16th-24th) an a MERLIN was seen throughout the month. KITTIWAKE were seen on three dates with a maximum of 120 (9th). A WATER RAIL was at New Passage (16th) and a rarer visitor was a RED LEGGED PARTRIDGE on Northwick Warth (29th). JACK SNIPE were seen on the 2nd, 3rd and 30th on the Grebe Pond, Northwick Warth. Scarce passerines at New Passage included a YELLOWHAMMER (17th) and BRAMBLING (29th) A RAVEN was seen on four dates. This was an excellent month for sea birds. Two different PUFFIN (only the 2nd and 3rd live records) were seen off Severn Beach on the 5th and 9th. The second bird eventually floated upriver to New Passage. Other quality sea birds off Severn Beach included at least two LEACH’S PETREL on the 9th and a single on the 12th, FULMAR (9th and 26th). KITTIWAKE were seen on eight dates with a maximum of 300 (23rd). Other scarce gulls at Severn Beach involved first winter LITTLE GULL (11th & 27th) and an adult MEDITERRANEAN GULL (24th). A LITTLE EGRET was seen at the Orchard Pools (7th-10th). 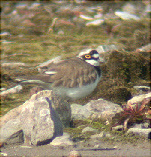 JACK SNIPE and WOODCOCK were seen at Severn Beach (17th), up to three GREEN SANDPIPER were present on the Orchard Pools. Two WATER RAIL were seen at Chittening (24th). Up to two SHORT-EARED OWLS were seen in the Orchard Pools area 15th-24th. A male BLACKCAP was seen on 17th and a YELLOWHAMMER on 23rd. An AMERICAN GOLDEN PLOVER was seen and heard over New Passage on the 1st where a GREAT CRESTED GREBE was also present. Strong south west winds on the 28th produced a LEACH’S PETREL, adult GANNET, LITTLE GULL and 200 KITTIWAKE off Severn Beach. Kittiwakeswere also seen on 23rd (3), 26th (160) and 27th (5). Other scarce gulls in the month included an adult YELLOW-LEGGED GULL on Northwick Warth (4th) and adult MEDITERRANEAN GULL at Severn Beach (4th) A LITTLE EGRET was mobile from the 5th to the 28th. Wildfowl of note involved four BEWICK’S SWAN west over Northwick Warth (5th), two BRENT GEESE on Northwick Warth (25th) and the high count of 67 PINTAIL off Severn Beach including a flock of 54 heading north east (26th). The only notable waders were single BAR-TAILED GODWIT (7th) and GOLDEN PLOVER at New Passage (14 on 6th and 35 on 7th). A MERLIN was at Northwick Warth (4th) and a male BLACKCAP at New Passage (7th).